WASHINGTON, D.C. -- Immigration has risen to the top of the list when Americans are asked to name the most important problem facing the nation -- edging out the government, which has been the top issue each month since January 2017. The 22% of Americans in July who say immigration is the top problem is up from 14% in June and is the highest percentage naming that issue in Gallup's history of asking the "most important problem" question. The previous high had been 19%. Mentions of immigration as the nation's most important problem have averaged 5% over the 17 years Gallup has been asking the question on a monthly basis. When Americans' naming of immigration as the top problem has exceeded that average by a significant margin, it has reflected real-world events, political attention being paid to the topic, fluctuating salience of other issues and news coverage. Immigration reached 19% of mentions as the top problem facing the nation in April 2006, as Congress was wrestling with the effort to pass a comprehensive immigration bill and as immigration protests in cities across the country dominated news coverage. Citations of immigration as the top problem rose again in the summer of 2014, as news attention focused on large numbers of immigrants attempting to enter the U.S. from Central America. Concerns over immigration have spiked again at points over the past two years, reflecting President Donald Trump's continued focus on illegal immigration, and the administration's often controversial policies designed to deal with the issue. The July survey came as news outlets and social media focused on reports of children being separated from their parents in response to Trump administration policies of apprehending families entering the country illegally. Trump subsequently modified that policy. The administration has also increased the actions of the U.S. Immigration and Customs Enforcement (ICE) agency in finding and deporting individuals living and working in the country illegally. Now, in Gallup's July 1-11 update, immigration has risen to the historical high point of 22%, topping the most important problem list for only the second time in Gallup's history. The other was in July 2014, when waves of minors migrating from Central America crossed the Southern U.S. border. Republicans have become increasingly likely this year to name immigration as the nation's top problem, while, until recently, mentions of immigration had remained relatively low among independents and Democrats. This month, Republican views of immigration as the top problem have spiked to 35% from 21% in June. 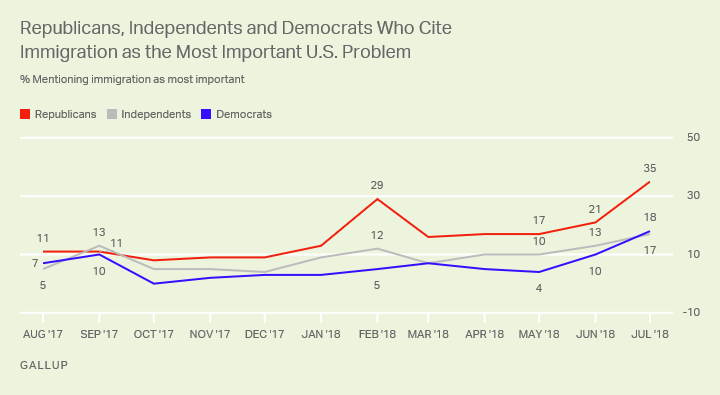 But the issue is becoming more top of mind to independents and Democrats as well; 18% of Democrats cited immigration this month, up from 10% in June, and independents' mentions are up four percentage points, to 17%. Immigration has jumped among Republicans as the top problem at other points in recent times -- including 29% last February, when it became a major sticking point in congressional debate on a new budget bill. At that time, however, mentions of immigration among independents (12%) and especially Democrats (5%) remained relatively low. Of course, partisan groups almost certainly have differing reasons for viewing immigration as the top problem currently. Republicans are likely thinking of the underlying problem of illegal immigration per se and its impact on the nation's economy and crime situation, while Democrats may be thinking more about the negative impact of the Trump administration's policies and actions in cracking down on immigration. The partisan divide on immigration is not new. In April 2006, the previous high point for immigration as the most important problem (19% overall), 30% of Republicans, 16% of independents and 11% of Democrats named immigration as the top problem. In July 2014, when overall concerns about immigration reached 17%, the partisan split was 23% Republicans, 16% independents and 11% Democrats. The 19% of Americans who cite government as the top problem in July is not out of line with what Gallup has found in recent months. Race relations or racism is mentioned by 7%, with concerns about unifying the country and lack of respect for each other coming in at 6% each. One significant takeaway from Gallup's recent updates on the nation's top problem continues to be the absence of concern about the economy. Just 4% of Americans say the "economy in general" is the top problem. Smaller numbers of Americans mention jobs and unemployment, the federal budget deficit, foreign trade, taxes and other economically related issues. When these are grouped together, the economy receives 14% of mentions, tied with March of this year for the second-lowest net economy mentions in Gallup's 27-year history of grouping economic concerns on a net basis. The lowest, 13%, came in May 1999. By contrast, net economic issues exceeded 75% nine times as the nation's top problem in 2008, 2009 and 2011, including the high point of 86% in February 2009. The 35% of Republicans who say immigration is the country's top problem is over twice as high as the 15% who mention government. Government continues to be viewed as the top problem among Democrats, with the 27% mentioning that issue well ahead of the 18% naming immigration. Independents this month are equally likely to cite immigration and government (17% each). Overall, four problems make the top five list for all three partisan groups: immigration, government, unifying the country and lack of respect for each other. The economy and moral/ethical decline (tied) round out the top five list for Republicans, while race issues complete the top five for the other two groups. The midterm congressional elections are now less than four months away, and the growing prevalence of immigration in Republicans' perceptions of the most important problem facing the nation could make it a fruitful theme for GOP candidates working to retain their party's House and Senate advantages. President Trump's successful 2016 presidential campaign rested in part on his controversial proposals relating to immigration. He has continued to ratchet up the focus on the issue since taking office through his policy proposals and actions at the border, particularly the highly visible separation of children from parents who cross into the country illegally. Trump's administration has modified its policies on the separation of children and parents. But if the general immigration focus continues through the fall, GOP candidates may be able to fire up the enthusiasm of the part of their base highly concerned about immigration and that in turn favors the Republican approach to this issue. Of course, to a lesser degree, with a rising percentage of Democrats mentioning immigration as the top problem, Democratic candidates can also gain traction on the issue -- by registering their opposition to Trump and Republican policies and actions. The most recent Gallup survey was in the field over the first 11 days of July. Since then, news coverage of the Trump administration has shifted to foreign policy with Trump's controversial travels to Brussels, London and Helsinki. Still, immigration has been a significant top-of-mind concern for Americans, particularly Republicans, for a number of months now, and it's likely that it will remain an important campaign theme no matter what events occur between now and Election Day in November.